Binyamin Netanyahu calls out for unequivocal condemnation of Jeremy Corbyn for being present or in the vicinity of a wreath-laying for Munich terrorists. I will take Jeremy Corbyn’s word as a man of peace over that of a man of war. In July 2006, right-wing Israelis including Binyamin Netanyahu attended a 60th anniversary celebration of The King David Hotel bombing a terrorist attack carried out on Monday, July 22, 1946, by the militant right-wing Zionist underground organization the Irgun on the British administrative headquarters for Palestine, which was housed in the southern wing of the King David Hotel in Jerusalem. 91 people of various nationalities were killed, and 46 were injured. 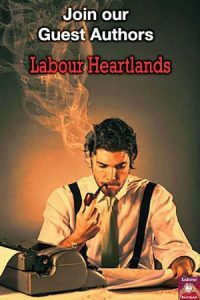 Disguised as Arab workmen and as hotel waiters, members of the Irgun planted a bomb in the basement of the main building of the hotel, whose southern wing housed the Mandate Secretariat and a few offices of the British military headquarters. The resulting explosion caused the collapse of the western half of the southern wing of the hotel. Some of the inflicted deaths and injuries occurred on the road outside the hotel and in adjacent buildings. 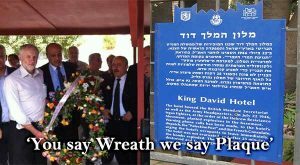 The laying of the plaque a memorial to the Zionist terrorist was condemned by the British Government via its Ambassador in Tel Aviv. The terror attack on the King David Hotel in Jerusalem was in its day the equivalent of the Twin Towers; yesterday was its 60th anniversary. There are two historic plaques at the hotel, one of whose wings was used by the British Mandate authority. On one of the plaques, which has been hanging there for some time, a few words note the terror attack: On July 22, 1946, the Etzel underground bombed the southern wing. The action is attributed to Etzel alone, but there is no condemnation. Underground generally has a positive connotation. The unveiling of the other plaque was meant to cap an academic conference held at the Menachem Begin Heritage Center on the issue of who is a freedom fighter and who is a terrorist. It was quite a week to clarify such a question. They can be distinguished by organizational affiliation, goals, targets, means of combat and mode of operation. They all assume that a freedom fighter is a good person and a terrorist is a bad one. Nearly every terrorist defines himself as a freedom fighter, and vice versa: freedom fighters are usually defined as terrorists. So was Begin. He invested a lot of effort to convince history that he was not a terrorist. Among other things, he emphasized that his organization did not harm civilians. There a thesis that could serve as a history lesson from a moral standpoint: not harming civilians. The new plaque identifies the perpetrators of the attack as Etzel fighters. It important for them to emphasize that they acted under orders from the Hebrew rebel movement, in other words, the Hagannah, among others. They called the hotel switchboard, the editorial offices of the Palestine Post, and the French Embassy (presumably they meant the consulate) to prevent casualties. In other words, they sought a terrorist attack without casualties, but something went wrong. Twenty-five minutes went by and then for some reason the British did not evacuate the building and as a result, 91 people were regrettably killed. There were 28 British, 41 Arabs, 17 Jews and five others. To emphasize the military aspect of the operation, the plaque notes that one of the Etzel people was killed in an exchange of fire. AS ISRAEL wages war against Hezbollah “terrorists” in Lebanon, Britain has protested about the celebration by right-wing Israelis of a Jewish “act of terrorism” against British rule 60 years ago this week. The rightwingers, including Binyamin Netanyahu, the former Prime Minister, are commemorating the bombing of the King David Hotel in Jerusalem, the headquarters of British rule that killed 92 people and helped to drive the British from Palestine. They have erected a plaque outside the restored building and held a two-day seminar with speeches and a tour of the hotel by one of the Jewish resistance fighters involved in the attack. The British government is demanding the removal of the plaque. Her Majesty’s ambassador and the consul have written to the mayor of Jerusalem that such an act of terror cannot be honoured, even if it was preceded by a warning. To this day, it is not clear what made the bombing planners believe the British would evacuate the building. Would Benjamin Netanyahu, as prime minister, have ordered his bureau evacuated on the basis of telephone threat from a Palestinian terror group? Netanyahu spoke at the conference. The difference between a terrorist operation and a legitimate military action is expressed, he said, in the fact that the terrorists intend to harm civilians whereas legitimate combatants try to avoid that. According to that theory, the kidnapping of an Israeli soldier by a Palestinian organization is a legitimate military operation, and the bombing of Dresden, Hanoi, Haifa or Beirut is a war crime. Of course, this is not what Netanyahu meant. He learned only this from the bombing of the hotel: that the Arabs are bad and we are good. Arab actions starting in 1920 and through the Iranian nuclear plan reflect, in his words, a terrorist mentality. Israel, on the other hand, only harms civilians by accident or when there is no alternative. For example, when terrorists hide among civilians. The historic truth is different: In the 60 years since the attack at the King David Hotel, Israel has hurt some two million civilians, including 750,000 who lost their homes in 1948, another quarter million Palestinians who were forced to leave the West Bank in the Six-Day War and hundreds of thousands of Egyptian civilians who were expelled from the cities along the Suez Canal during the War of Attrition. And now tens of thousands of Lebanese villagers are being forced to abandon their homes, and air force pilots are once again bombing Beirut and other cities. Hundreds of civilians have been killed. Regrettably. It’s all in the spirit of the King David Hotel. One can always say there was a mishap. ‘Israel’ the Founding Fathers of Modern Terrorism King David Hotel Bombing. The King David Hotel bombing was an attack carried out by the militant right-wing Zionist underground organisation, the Irgun, on the King David Hotel in Jerusalem on 22 July 1946. Irgunists, disguised as Arabs, planted a bomb in the basement of the main building of the hotel, under the wing which housed the Mandate Secretariat and part of the British military headquarters. The ensuing explosion caused the collapse of the western half of the southern wing of the hotel. As a result of this, 91 people are killed, most of them civilians: 41 Arabs; 28 British; 17 Jews; and 5 others. Around 46 people are injured. Motivation for the bombing The King David Hotel was the site for the British Military Command in Palestine. It also served as the headquarters of the British Criminal Investigation Division. The Irgun aimed at destroying the southern wing of the hotel, which housed the Mandate’s intelligence records about Irgun, the Hagana, Lehi, and other Jewish paramilitary groups. The larger goal was to drive the British out of Palestine, and to pit the British against the Palestinian Arabs if Arabs are successfully framed for the bombing. The British soon realize governing Palestine is too much trouble, leaving 2 years later, and the state of Israel is born in 1948. Future Israeli Prime Minister, Menachem Begin, then leader of the Irgun On July 1, 1946, Moshe Sneh, chief of the Haganah General Headquarters, sent a letter to the then leader of the Irgun, Menachem Begin, which instructed him to “carry out the operation at the “chick”, code for the King David Hotel.” When he was asked by prominent journalist, Russell Warren Howe, if he considered himself the father of terrorism in the Middle East, Menachem Begin proudly replied, “No, in the entire whole world.” Israelis Celebrate the Bombing and Admire the Terrorists as Heroes In July 2006, Israelis, including the past and future Prime Minister Benjamin Netanyahu and former members of Irgun, attended a 60th anniversary celebration of the bombing, which was organized by the Menachem Begin Centre.